Thanks to an invitation from a couple of dear friends, Amy and I got to spend Saturday night in Boca at the Brewtopia Festival at the Morikami Gardens. If you get the chance to go to the next one, I urge you to do so, especially if you love beer like we do. The fact that it raised money for a decent cause was lagniappe. The festival featured both local brewers and distributors bringing in the best beers from around the world--my favorite was the table where they were serving Caracole, St. Bernardus and Duchess de Bourgogne. The table right next to it had a surprisingly delicious Raspberry Framboise which smelled like cough syrup but tasted like heaven. There were some experiments that I felt didn't go so well. The blueberry smelled great but didn't come through on the taste. The ginger flavored beer overwhelmed me. The brewery that produced the most memorable moment was Inlet Brewery home of Monk in the Trunk. I told the guys serving that they should do an ad to the tune of "My Humps." (Whatcha gonna do with all that Monk, all that Monk up in that trunk. I'ma getgetgetget you drunk, get you drunk up on my Monk.) They apparently hadn't heard the suggestion before. I was surprised. And the beer was quite good too--almost my favorite beer of the night. 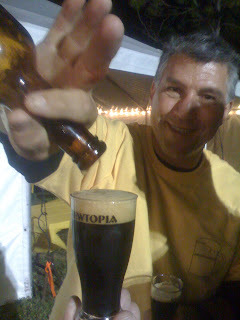 I say almost because the best beer of the night was our last, and it was provided by this wonderful gentleman. It's a beer that's not sold in Florida, called Allagash Black, and it was heaven in a bottle. Smooth and creamy and silky, a perfect end to the evening. Here he is, pouring up the last into Amy's sample cup. Next year, I plan to be there when the gates open.